Stuck on a Kansas farm with her aunt, uncle and dog Toto, Dorothy Gale wishes for a better and more exciting life. When a twister hits, Dorothy is whisked away to the wonderful world of Oz, a fantastical place full of munchkins, a cowardly lion, a tin man without a heart, a living scarecrow...and a wicked witch who will do whatever it takes to stop Dorothy. "...In shaping the musical "Wizard of Oz" for Aurora's massive Paramount Theatre, director/choreographer Amber Mak and music director Kory Danielson go for broke. Between the cyclone and the Emerald City and the battalion of flying monkey/cow/cyclist puppets, it's pretty clear that the Paramount's special-effects budget could probably rival those of the classic film." "...Commanding center stage is Des Plaines native Stenholt, who is every bit an impetuous 12-year-old. Her sweetly sung, convincing Dorothy is an ideal combination of dreaminess and willfulness. The former she beautifully conveys in Harold Arlen and E.Y. Harburg's signature "Over the Rainbow." The latter the righteously angry Dorothy conveys by lashing out at surrogate parents Auntie Em and Uncle Henry (played with understated warmth by Plumpp and Steve O'Connell)." "...'The Wizard of Oz� is a great way to kick off the holiday season with some memorable songs such as �"Follow the Yellow Brick Road,� We�re Off to See the Wizard," "Over the Rainbow," "Ding-Dong! The Witch Is Dead," and "If I Only Had a Brain;" it's an awesome experience of musical theater extravaganza!" "...When you head south, to the second largest city in the state of Illinois, you are NOT in Aurora anymore! No, you are in the wonderful �land of Oz�, L.Frank Baum�s classic story with delightful music and lyrics by Harold Arlen and E.Y. Harburg. Director/choreographer Amber Mak does her magic again on the stage of The Paramount Theatre. The movie that is a classic ( played at holiday time on many TV stations) transforms itself to a magical two and a half hours of entertainment that every family can enjoy. No matter your religious belief, race, ethnicity, financial situation, �The Wizard of Oz� will bring you back to your childhood and for those in their childhood, will create memories of love, friendship, and the ability to make others feel your love." "...The result, on all counts, is a Broadway-worthy show of grand scale and exceptional imagination � a production that spins onto the stage with the force of the cyclone (even if some insist the proper term is tornado) that knocks out Kansas farm girl Dorothy Gale just long enough for her to take a scary but fantastical journey to the Land of Oz and Emerald City." "...A true feast for the eyes, ears and soul, this musical is a magically delightful stage adaptation of the classic 1939 film that made a star out of a young Judy Garland. Adapted from L. Frank Baum�s children�s book, the faithful play is by John Kane, of the Royal Shakespeare Company. It features the beloved music and lyrics of Harold Arlen and E.Y. Harburg." "...Under the superb direction of Amber Mak, the production is a delight for the brains and hearts of the whole family, although with a PG rating, audiences should ensure the youngest viewers in their party are old enough to maintain their courage through some of the louder, scary scenes. There are loud sounds & strobe lights & fog, oh my." "...When all the world is hopeless jumble, it is good to know that some things can always be counted upon to help you make your dreams come true. 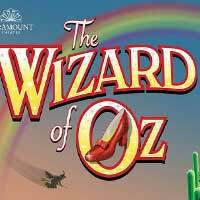 The time-honored story of "The Wizard of Oz" live on stage is an experience for young and old of all ages which makes the Paramount production perfect family fare for the holiday season, and brings new meaning to the lyric: Fa La La La La La La La La La!"